It may have escaped most people’s notice, but Universal Studios has been trying to revitalize its fondly remembered 1941 monster property The Wolf Man (two words) for over 20 years. The Wolfman (one word) is a monster reboot determined not to make the same mistakes as its recent predecessors. 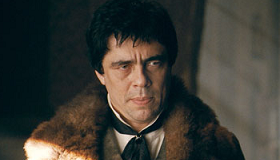 It stars Benicio Del Toro as Lawrence Talbot, an American actor in Victorian England (improbably, this flat-voiced yank is known for his brilliant Shakespearean performances) who is bitten by a werewolf and becomes a monster himself. Anthony Hopkins plays his father; Emily Blunt is his girl. Quite a cast on paper, which underscores the seriousness of Universal’s intention to raise an antique horror character back from the dead—something easier to do in a movie than it is at the box office. Where the Wolf Man-featuring Monster Squad (1987) was a flop aimed squarely at children, The Wolfman is resolutely R-rated and about as violent a film as you’re likely to see. Where the revisionist Van Helsing(2004) failed even to focus on the Wolf Man properly (because it was trying to reactivate the entire Universal monster line up in one fell swoop), The Wolfman is focused on the single character and stays almost reverently respectful to its 1941 cinematic source. Aside from 1999’s The Mummy, this is the best of Universal’s recent horror output—which is faint praise, since that puts The Wolfman in the middle of a muddling lot. Still, there is enough dynamism in the horror scenes and the creature itself is still compelling enough for Wolfman to find an audience, though it’s likely to be a smaller one than Universal entered into this project hoping for. Pity the poor Wolf Man. Within the Universal Horror stable, he was never as beloved as the bolt-necked Frankenstein Monster or the Lugosi-accented Dracula. (I say “Lugosi-accented,” because it was part of the Universal Dracula’s appeal that he spoke in a dialect representing no nation other than the Transylvania inside Bela Lugosi’s skull). The Wolf Man came along toward the end of the great days for Universal’s monsters, as the budgets were getting cheaper and the directors were becoming hacks. In 1931, the Dracula and Frankenstein film series were launched respectively by two of the cinema’s grand eccentrics: Todd Browning (Freaks) and James Whale (The Old Dark House). Ten years later, The Wolf Man franchise was inaugurated by George Waggner, a filmmaker whose only recorded stylistic flourish is that he took to spelling his last name with two capital G’s (waGGner) in the latter portion of his career. Popular though the Wolf Man proved, he never even got a proper sequel. His second film was Frankenstein Meets The Wolf Man, where the second billing says it all; then House of Frankenstein, House of Dracula and, finally, Abbot and Costello Meet Frankenstein—three pictures in a row where Universal never even bothered to mention him in the title. And yet the Wolf Man endured, especially once his original adventures made it to broadcast TV. Maybe it was the make-up (created by Jack Pierce, who was also responsible for look of the Karloff Frankenstein). Maybe it was Curt Siodmak’s nifty little radio play of a script. It might even have been the central performance by crag-faced Lon Chaney Jr. A terrible actor with a career-ravaging drinking problem cast only to capitalize on his father’s fame, Chaney’s battered pugilist’s face was so unlike the bland prettiness of Hollywood leads of his era that it gave the accursed Larry Talbot a cartoon gravitas, even when Chaney played him like a man who just swallowed a chihuahua. Benicio Del Toro looks even more like Lon Chaney Sr. than Chaney Jr. did, and he’s a far better actor than the previous Wolf Man. But aside from his remarkable face, he’s fundamentally wrong for this part. Watching this cocky, naturalistic player attempt to portray a Victorian brooder is like watching Brando attempt slapstick in A Countess from Hong Kong—you are surprised to encounter something Del Toro can’t remotely pull off. Maybe it’s because the Talbot/Wolfman schism is so complete—the one is all super ego, the other all raging and feral id. When the monster is on the loose, you don’t even feel like you’re looking at the same performance; when Talbot holds the screen, Del Toro is given almost nothing but impacted woe to play. As a performer, he’s best navigating the tension between external action and internal thought; as a bi-polar monster, he’s all one or the other, and can’t seem to find a bridge between them. Director Joe Johnston and creature maker Rick Baker do pull off a couple of terrific setpieces, though. A rooftop chase scene races through a Victorian London far more geographically convincing than the over-praised bluescreen vision of Guy Richie’s recent (and otherwise far superior) Sherlock Holmes. A transformation scene in a crowded medical amphitheatre (allegedly added in reshooting) plays like knowing black comedy and Freudian pastiche. The action scenes are pure kinetic motion, which is what Johnston is best at; he fares less well when he goes for mood or suspense, and has an unnerving tendency to synchronize loud wolf snarls with unrelated activities like leaves blowing or doorknobs being turned, as if we need to be reminded what movie we’re watching whenever the title character is offscreen. If you can’t chew the scenery in a movie about werewolves, where can you?